The structural weight reduction is the most visible effect of composite application, but it’s primarily important for aircraft or spacecraft only. In engineering branches the major effect of fiber reinforcement plastics (FRP) application is the ability to solve some fundamental technical challenge, for example: simplifying design of construction, the overall dimensions reducing of the elastic element, non-fragile, etc. In this paper the methodological approach to FRP application considered. Some examples of engineering design for vehicle load-bearing FRP element are presented. Typical casting simulation procedure doesn’t consider exact cores and molds material properties as a primary factor. Sometimes mold is considered as an isotropic body characterized with constant averaged thermophysical and other properties. On the other hand there are a lot of practically collected data confirming the fact that input of exact non-uniformly distributed thermophysical mold properties during casting simulation may seriously improve the prognosis of casting quality. The present work is dedicated to interconnections between molds compacting conditions and castings quality. It has been proposed to carry out the computer modeling of compacting process for further use of the calculation results as a part of input for casting simulation software. Using an original mathematical model the calculate analysis of the relationship of thermal modes of castings production with crystallization kinetics and microstructure parameters of the alloy Cu47Ni8Ti34Zr11 is made. It is shown, that at cold mold casting in castings of different thickness are fixed three types of microstructure: amorphous with inclusions of so-called "quenching nucleus", amorphous- crystalline and polycrystalline with microscale size of the crystals. For castings with a completely crystallized nanocrystalline structure proposed method of isothermal quenching melts, which is realized by casting the melt into the preheated mold. Determined values of the initial mold temperature interval provides for the formation of castings having a grain size of 100 nm for justifiable from an economic point of view intervals. In practice there are several known methods of inserting the nanopowder to the welding layer, they are specified according the conditions needed for the welding process. 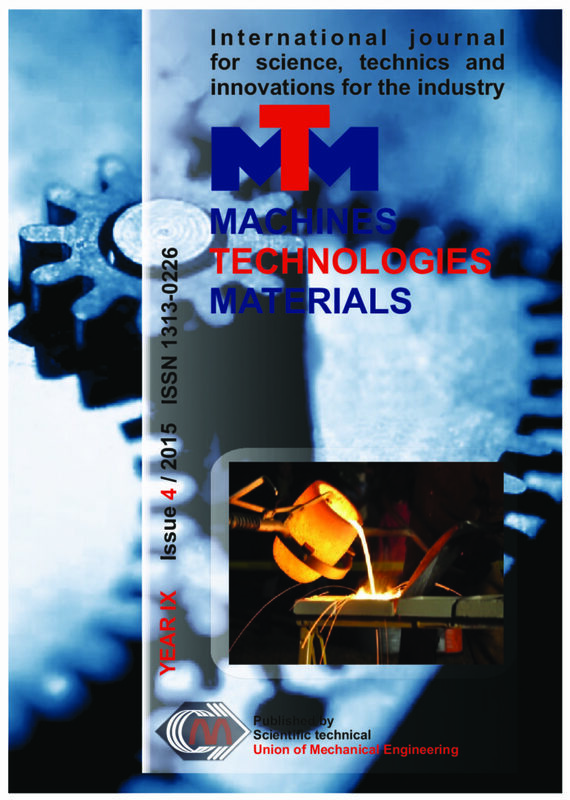 This article examines some new and innovative opportunities of liquid phase modification through insertion of nano-sized particles without being melted, according to TIG and Impulse TIG overlay welding methods. Contemporary production of castings is inevitably associated with improvement of foundry mixtures, and in particular with quartz sands as a basic moulding material. The interest is motivated by opportunity of reaching mixture’s appropriate parameters at different combinations between sands and binding compositions. One option of particular importance in obtaining mixtures’ physical and mechanical, and technological properties is to get a greater number of contact points among individual grains of quartz sands. The report examines the impact of dispersive mineral particles for increasing contact points of interaction between individual sand particles in the process of solidification. A theoretical basis for the possibility of applying such reinforcement in the preparation of mixtures is presented. An attempt for optimization has been done by some criteria – porosity, morphology, gas permeability and other properties. Results and conclusions from the conducted tests have been graphically presented. The aim of the present paper is to test the synthesis of moulded metal composites (MMCs) with a metal matrix Al and a strengthening metal phase Fe of type „in vitro” and „hybrid”. There was a test done for the preparation of composites using a method similar to “capillary forming”, such as the metal matrix (melt of aluminium) was infiltrated in the space between the iron blasting grit which is the inversely option of solving similar problem in which problems the blasting grit (the strengthening phase) are forcibly implemented into the melts (the metal matrix). In this way the problem which needs to be solved, in which the melt is infiltrated between the space of the iron blasting grit, allows for the maximum reduction of the volume of the metal matrix on account of the strengthening phase. The experiments were conducted with laboratory equipment elaborated on the base of another equipment for "capillary forming" with extra vacuum, patent protected developed by the department ”Materials Science and Technology”. From the received moulded metal composites (MMCs) were establish areas of reaction between aluminium and the iron powder. The experiment produced significant results as received alloying between iron and aluminium at a relatively low temperature of melting of the iron in which there were received metal-composites structures of the type „in vitro” and „hybrid”, which were tested by metallography and micro-hardness analysis. In this work are discussed some experimental data about the obtaining of recast layers on the surface of high speed tool steel after electrical discharge treatment in electrolyte. The electrical discharge treatment of steel surface in electrolyte produces a recast layer with specific combination of structure characteristics in result of nonequilibrium phase transformations. The modification goes by a high energy thermal process in electrical discharges on a very small area on the metallic surface involving melting, alloying and high speed cooling in the electrolyte. Obtained recast layers have a different structure in comparison with the metal matrix and are with higher hardness, wear- and corrosion resistance. The machines are one of the most important pillars in the industrial economy of the European Union. The aim is to reduce the enormous social price paid for accidents at work, by integration of safe design and construction, as well as proper installation and maintenance. A harmonized regulatory framework for the design and manufacture of machines is of major economic importance for European industry. At the same time, the safety of machinery makes an important contribution to reducing the social costs of damage to health and accidents at home and workplace. The article presents a numerical study of pre-injection strategy in order to reduce the rate of heat release and pressure rise in a modern direct injection diesel engine, developed for passenger car. A model of the engine was built in advanced simulation code AVL BOOST. In order to determine the injection rate a supplementary model of the solenoid injector was built in AVL HYDSIM. A study of rate of heat release and pressure rise into combustion chamber was conducted at single operating point. The engine effective power was taken into consideration as well. The results revealed that pre-injection strategy is a promising approach for reducing the rate of heat released and the engine noise at low speed and load. However, a precise control of pre-injected mass and injection timing has to be realised by engine control system.